Originally, all food was organic. In just over a century, since the advent of chemical manipulation in agriculture, we have branded organic food in certain ways that reinforce the cultural hegemony; many people construe organic products as liberal, expensive, upper-middle class, snotty, a fad. Others believe it to be healthier and more natural. Yet what is the battle over organic food really about? At its heart I think its about big agriculture conglomerates versus small traditional farmers. So isn’t it ironic that conservative values, normally used to encourage a pastoral traditional American image of the resilient farmer, are used to uphold their disenfranchisement? Organic food, and the idealogical battle around it (the notion that it’s liberal B.S. ), exemplifies how “though hegemony is ethical-political, it must also be economic” (Red, 76). The debate about organic food rarely centers on business. Even locavores, people eat food produced locally, espouse more about environmentalism than about the underlying cause of harmful environmental practices; big business. Gramsci claims that “all the questions around which the struggle rages [are] not on a corporate but on a ‘universal’ plane, and thus creat[e] the hegemony of a fundamental social group over a series of subordinate groups” (Red, 76). Organic food is argued in terms of ideology and class now, not on terms of big business vs. independent business. The contradiction of course, is that the belief in organic food as snotty and liberal is in fact further disenfranchising the worker. Independent farming, resistant of big business conglomeration, is an ideal example of rugged individualism, the traditional value behind the American Dream. At once these workers subscribe to the hegemonic ideology of the American Dream, though outdated, and resist the capitalistic business practices that the same ideology helps support. So, organic food is at once traditional and progressive. Nowadays it attempts to defy agriculture conglomerates through supporting organic farming and support health in a country that has replaced health with frugality. It has been made a contradictory ideological battleground, yet nicely sidesteps the capitalist reasons for the battle. Of course, organic food has met its fate: “incorporation into the system’s profit-making concerns” (Red, 92). 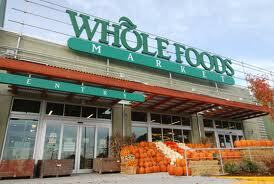 Whole Foods would seem a bastion of liberalism because it sells organic produce, right? Well, in some ways yes, some ways no; it supports local food production, but it is itself a large corporation. The CEO is decidedly anti-union, and has been subject to an antitrust lawsuit (I’m not politically savvy enough to say if that means Whole Foods is the man, or being put down by the man, however) (Wikipedia). So organic food, now appropriated as a liberal and progressive purchase, is as equally partaking in the dominant economic system as any “normal” food at the Safeway on Rose. Also, sorry I didn’t actually address the pun in the title..
“WHOLE FOODS IS CORPORATE!” is literally my friend Evan’s favorite thing to say ever. Definitely some really, really good points raised in this post. It seems that there is not possible way to avoid this hegemony. ALMOST EVERYONE, in some way, wants to be organic, and to support local business, but so many people shop at Whole Foods and other large corporation grocery stores. Do you think that the pricing of organic foods and the way our economy is today makes this hypocrisy sort of unavoidable? There is this ideal put out there that we can all support local and buy organic, but in reality, it is so expensive to buy everything you need from a farmer’s market (which seems to be the only way to avoid supporting any sort of corporation). Do you think people realize that Whole Foods is just part of the corporate machine but say “Eh, it’s the next best thing”? This is definitely not something you needed to put in your post, in my opinion. I am legitimately just curious. I think the pricing of Whole Foods in particular is the issue. Organic products at Safeway and Trader Joe’s, though more expensive than non-organically branded products, are often cheaper than at Whole Foods. The difference, at least in my experience isn’t huge but its enough to notice. There are also rumors, some substantiated and some not so, that Whole Foods knowing markets certain products as organic when they do not meet the proper criteria in order to raise their prices. Our Whole Foods in Oakland (which, in super hipster fashion, is built into and maintains the original molding and facade, of the old Oakland Cadillac dealership) frequently has a large group of protesters out front.